We’d love your help. Let us know what’s wrong with this preview of Who Shall I Be Today? by Sunita Saldhana. “Who shall I be today?” is a collection of poems that delves into what makes up a woman. It talks of a mother’s love and fears; a woman’s search for herself; the yearnings of the heart for that someone special. It tells of the hurt and pain that love brings, and the courage to Who Shall I Be Today? To ask other readers questions about Who Shall I Be Today?, please sign up. Be the first to ask a question about Who Shall I Be Today? 'Who Shall I be today' describes the different roles of being a woman, each poem explores the unique characteristics of women and the journey they go through in life. From a mother’s love to a woman in search for herself, from a yearning of the heart for someone special to the courageous act of picking up broken pieces. It is a complete explanatory work of art from the author's heart. The cover of the book is neat with mixed shades of light and dark pink. The book comprises of 57 heartwarming po 'Who Shall I be today' describes the different roles of being a woman, each poem explores the unique characteristics of women and the journey they go through in life. From a mother’s love to a woman in search for herself, from a yearning of the heart for someone special to the courageous act of picking up broken pieces. It is a complete explanatory work of art from the author's heart. The cover of the book is neat with mixed shades of light and dark pink. The book comprises of 57 heartwarming poetry, and each poem is wonderfully written with a message of deep emotion, fear, courage, nostalgia, love, death, pain and more feelings. I would surely recommend this book of poetry to all the powerful, courageous women out there. “Who Shall I be Today?” is a collection of 57 poems penned down by Sunita Saldhna. The poems are about the various roles a woman plays in her journey of life. Right from the time when her young love flourished to picking up the broken pieces of her heart, from being a daughter to motherhood, from loosing herself to finding her path. All the poems come from a space right from the author’s heart. The essence of womanhood is penned down beautifully with each poem being powered with emotions of love “Who Shall I be Today?” is a collection of 57 poems penned down by Sunita Saldhna. The poems are about the various roles a woman plays in her journey of life. Right from the time when her young love flourished to picking up the broken pieces of her heart, from being a daughter to motherhood, from loosing herself to finding her path. This book is a collection of poems of varying emotionsbrought together as you would a string of colourful beads. that a woman plays various roles and goes through varied emotions in her day to day life. The poems are heartfully penned that found an entry straight to my heart. Though the book is small, the power that the poet packs in her poems using simpl This book is a collection of poems of varying emotionsbrought together as you would a string of colourful beads. The poems are heartfully penned that found an entry straight to my heart. Though the book is small, the power that the poet packs in her poems using simple words is tremendous. I love poetry that's simple and understandable. This book did just that for me. It pulled the heart strings in so many ways that it has to be experienced. This is one of those books that you can keep on your bed side table and open a page at random and see what emotion it holds for you. You definitely can enjoy it as a continuous read too but be ready to feel those varied emotions. My perception of a poetry is the free flow of a poet’s imagination intertwined with a flood of emotions and adorned by figures of speech. Half the fun of reading a poem is in its ambiguity. I admire the intentional ambiguity in the poetry, as it leaves it to the imagination of the readers to decipher and interpret the meaning by using their hearts and brains. Having said that, sometimes I enjoy reading poems to take a walk down the memory lane or be showered with the depths of emotions that a po My perception of a poetry is the free flow of a poet’s imagination intertwined with a flood of emotions and adorned by figures of speech. Half the fun of reading a poem is in its ambiguity. I admire the intentional ambiguity in the poetry, as it leaves it to the imagination of the readers to decipher and interpret the meaning by using their hearts and brains. Having said that, sometimes I enjoy reading poems to take a walk down the memory lane or be showered with the depths of emotions that a poet delivers in their poems. 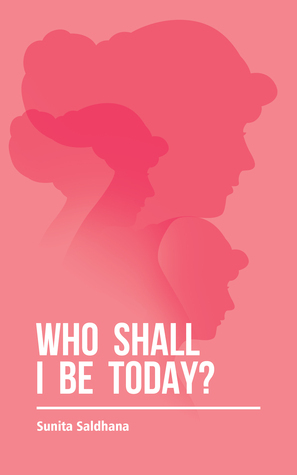 Sunita Saldhana's Who Shall I be Today is a collection of poems which explores the many roles of being a woman. The first poem in this collection is titled 'Words'. I fell hook line and sinker with that one itself. It just got better as I read along. The poems in Who Shall I be Today explore varied emotions. Independence, Companionship, Fighting depression, Pain, Nostalgia, Love, Death, Motherho Sunita Saldhana's Who Shall I be Today is a collection of poems which explores the many roles of being a woman. Independence, Companionship, Fighting depression, Pain, Nostalgia, Love, Death, Motherhood, Work, Writing and more. It is a celebration of the many roles that a woman plays. I have loved each of Sunita Saldhana's poems... each one different. Some abstract, some describing particular experiences. Some full of joy, some fighting pain. But each one delightfully written. I loved how every poem en captures emotions and the words define it beautifully. I almost thought it was a poetic version of the famous Chicken Soup series. Easy to read and re-read, something that could be gifted to your friends and daughters. I also liked the laid back simplicity of some poems like - where is the time? If you're looking for a light poetry read, but something that makes complete sense. I totally recommend this book. Poetry is the art of expressing oneself in a musical manner. The words dance to the tunes of the writer’s heart and the verse that is panned out of the amalgamation of beautiful words and emotions reflects the beauty of the writer’s heart. ‘Who Shall I Be Today?’ by Sunita Saldhana is a collection of poems that are written from the heart. The poems delve into what makes up a woman. It is a celebration of womanhood and is guaranteed to touch the soul of every woman who reads it. The author Poetry is the art of expressing oneself in a musical manner. The words dance to the tunes of the writer’s heart and the verse that is panned out of the amalgamation of beautiful words and emotions reflects the beauty of the writer’s heart. The author has done a great job at compiling her beautiful poems into a book to present them to voracious readers. The poems are well-written and composed deliberately. The flow of words is amazing and is bound to touch the heart of any reader. The theme around which these poems revolve is the life of a woman. Each poem, meticulously penned down, touches the nuances of the life of a woman in an impressive manner. The coherence of the verses is praiseworthy. The cover of the book is austere but the title contains great relativity and depth. The title itself coaxes one to think and cogitate upon one’s existence. As you read the poems, your answers find you. 'Who Shall I be today' is an amazing book filled to the brim with 57-poems, each of which describes the different roles of being a woman and what they entail. Each and every poem explores unique characteristics of women and the journey they go through in life, giving the reader insight into what being a mother is like, what being a women who is searching for who she is, is like, and what being a woman who is in love or who has been hurt is like. While reading each and every poem I felt deep emot 'Who Shall I be today' is an amazing book filled to the brim with 57-poems, each of which describes the different roles of being a woman and what they entail. While reading each and every poem I felt deep emotion. Whether it was strenght, weakness, love, sadness or something else, there is a poem conveying every emotion you can imagine and you will feel them all.